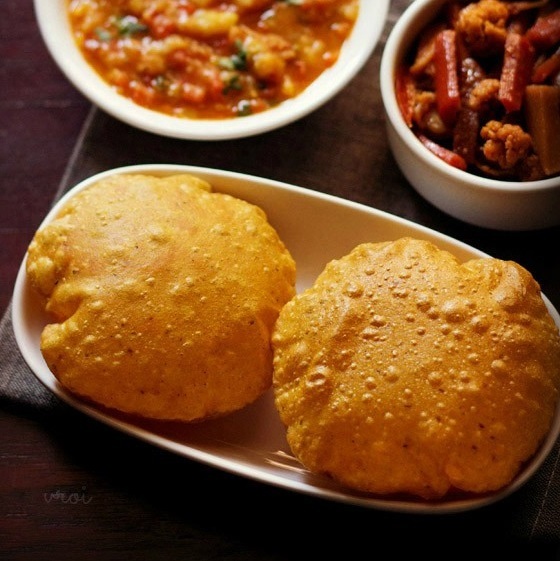 masala poori recipe - spicy and tasty pooris made with whole wheat flour and spices. 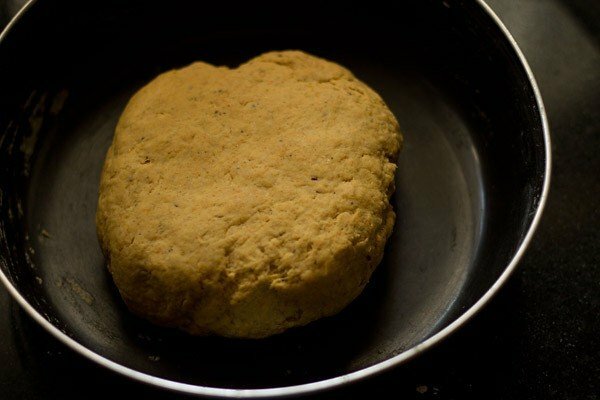 masala poori recipe with step by step by photos – spicy and tasty pooris made with whole wheat flour and spices. 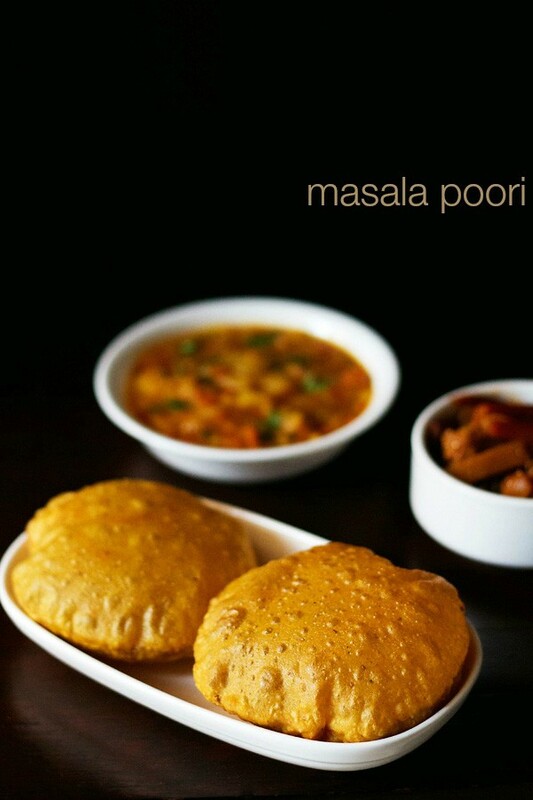 masala poori is a variation of poori. basically, these are unleavened spiced fried whole wheat bread. 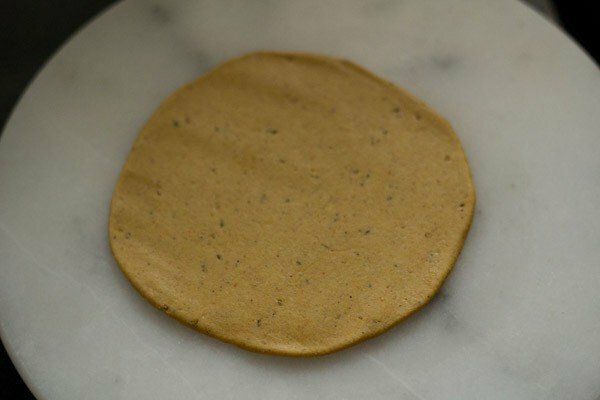 spices are used in the dough which gives the poori a unique taste and flavor. 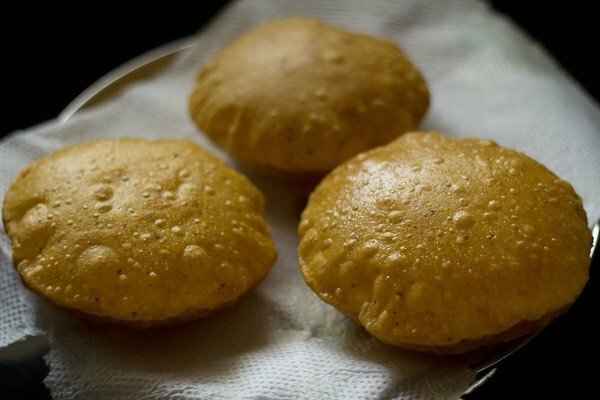 there are also other variations of poori like the stuffed poori where potato or peas filling is stuffed inside the poori and then deep fried. now speaking on pooris, there is another kind of a flaky fried bread that is very popular in north india and is called as kachori. 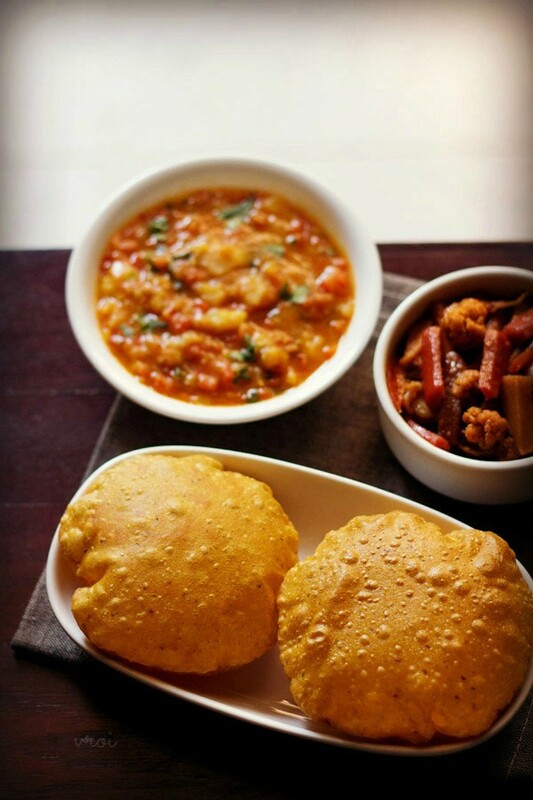 the kachori are stuffed with spiced lentil mixture, potato or peas stuffing. there are a delicious snack to have accompanied with coriander chutney and tea. this recipe of masala poori is from my home science notes. at home, we make another version of masala poori with fewer spices. 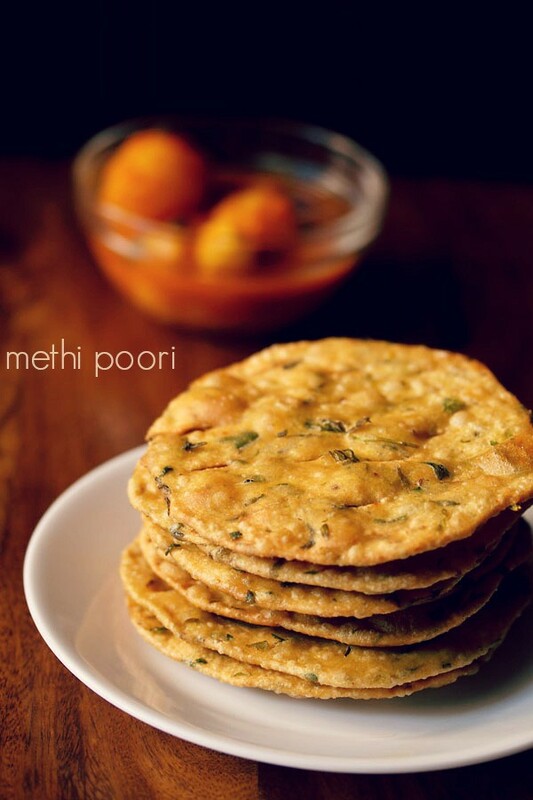 masala pooris can be had just plain with indian chai or even with potato curry or paneer sabzi. 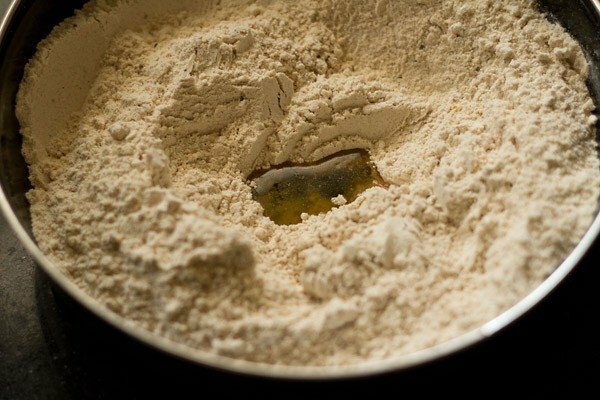 in a bowl or pan, add all the spice powders and salt to whole wheat flour. in a clockwise order the spices are - turmeric powder, cumin powder, coriander powder, ajwain or carom seeds, black pepper powder and red chili powder. salt is added in the center. 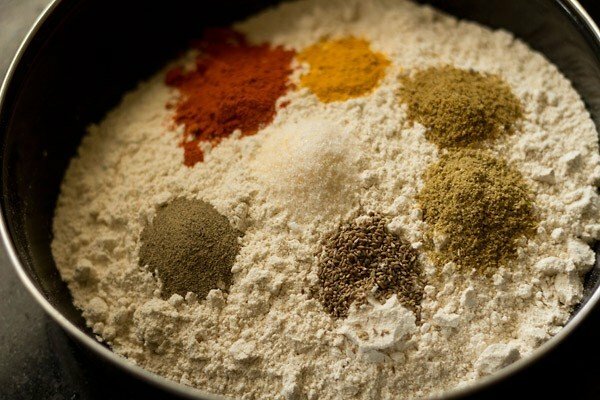 mix the spice powders with the flour with a spoon, so that the spices are evenly distributed in the flour. then make a well in the center and add oil. add some water. mix and then begin to knead. as required, add more water in between while kneading dough. knead into a firm dough with sufficient water. 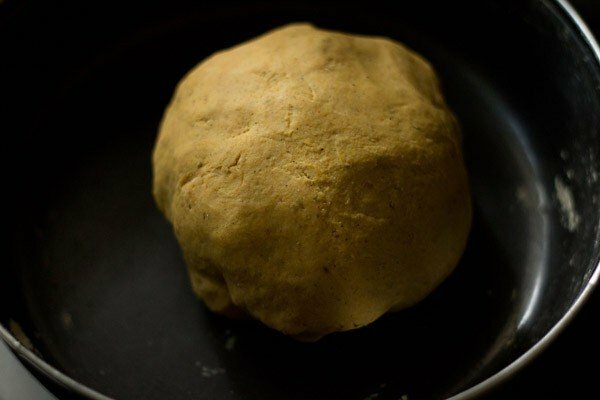 cover and let the masala poori dough rest for 30 minutes. 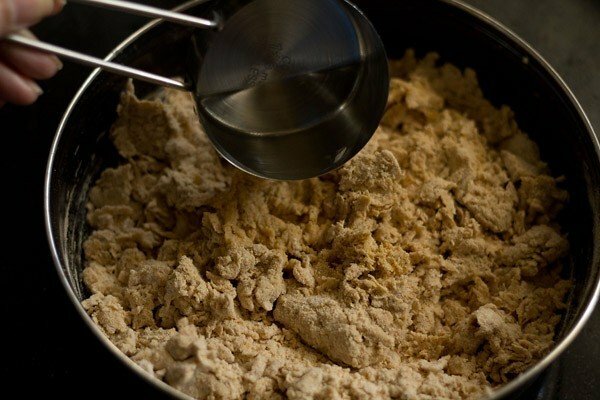 dough after 30 minutes. knead again. divide the dough into small or medium sized balls. take each ball. flatten it and spread a bit of oil on both sides. 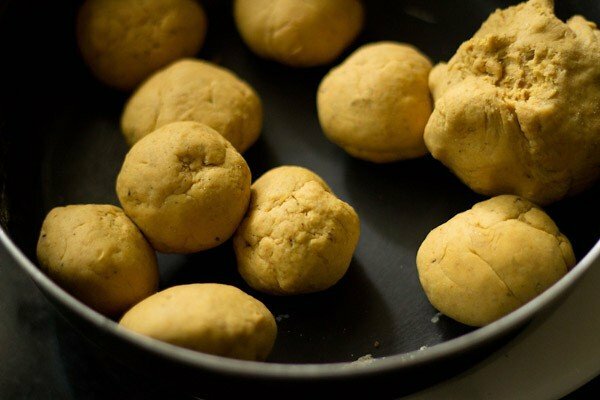 using oil while rolling is better than using wheat flour, as the whole wheat flour particles get browned or burned in oil, while frying. roll this ball into a small or medium sized circle of medium thickness. don't make too thick or thin. heat oil in a kadai or pan till its medium hot. slid the rolled poori and deep fry in hot oil. 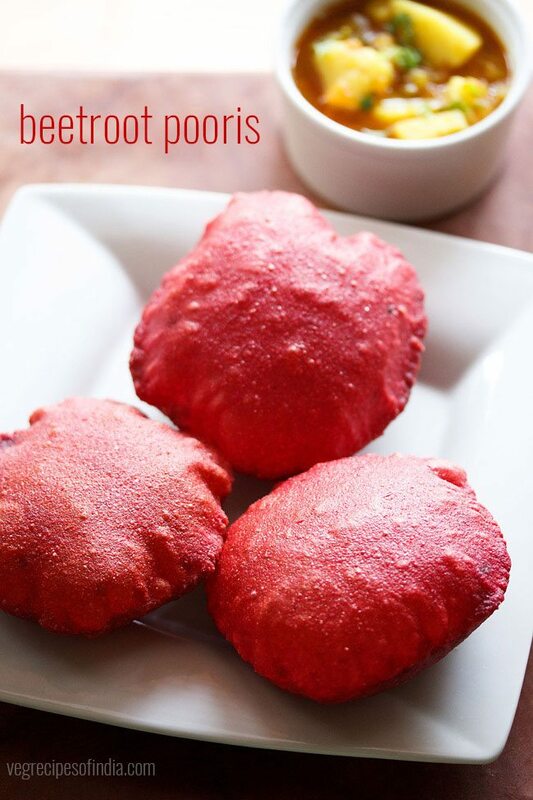 with help of a slotted spoon, gently nudge and press so that the masala pooris puff up. when the oil stops sizzling, turn over and fry the other side of the masala pooris. 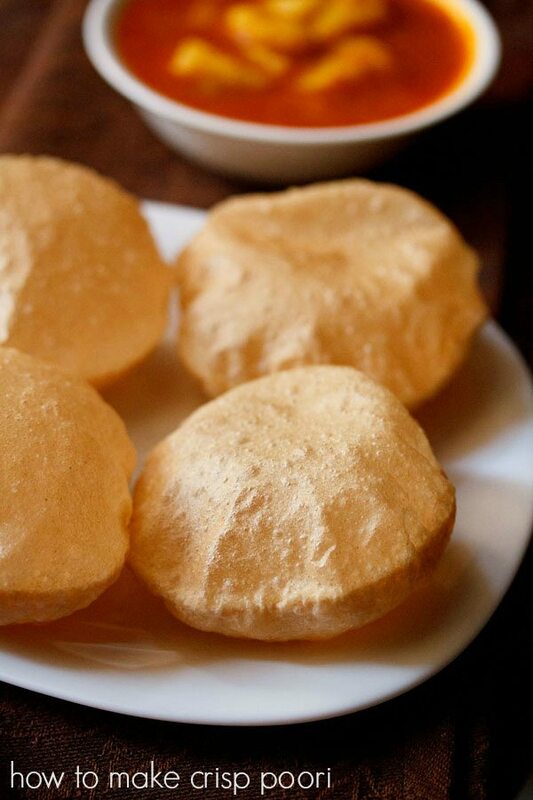 when golden, remove from the slotted spoon and drain the masala poori on kitchen paper napkins to remove excess oil. make all pooris this way. serve the masala pooris hot plain or with a side potato curry. 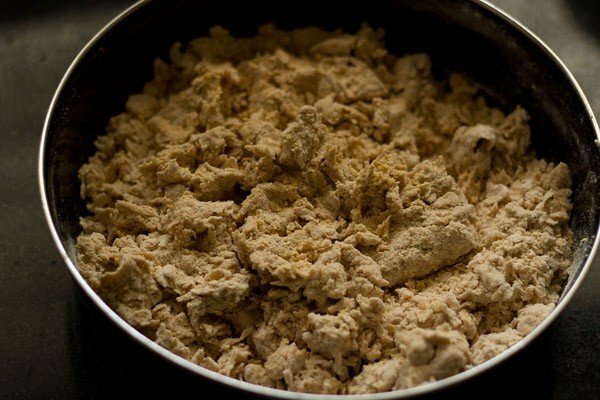 1. in a bowl or pan, add all the spice powders and salt to whole wheat flour. in a clockwise order the spices are – turmeric powder, cumin powder, coriander powder, ajwain or carom seeds, black pepper powder and red chili powder. salt is added in the center. 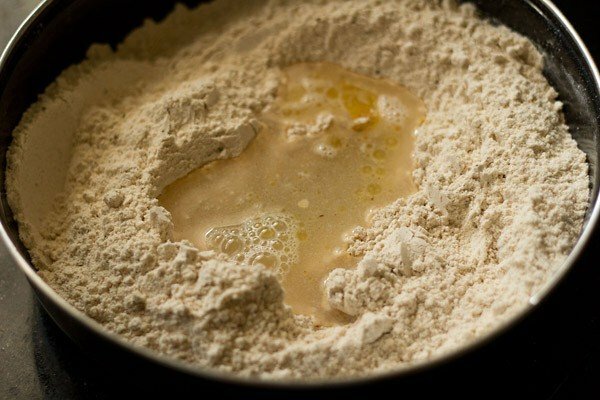 2. mix the spice powders with the flour with a spoon, so that the spices are evenly distributed in the flour. then make a well in the center and add oil. 4. mix and then begin to knead. 5. as required, add more water in between while kneading dough. 6. knead into a firm dough with sufficient water. 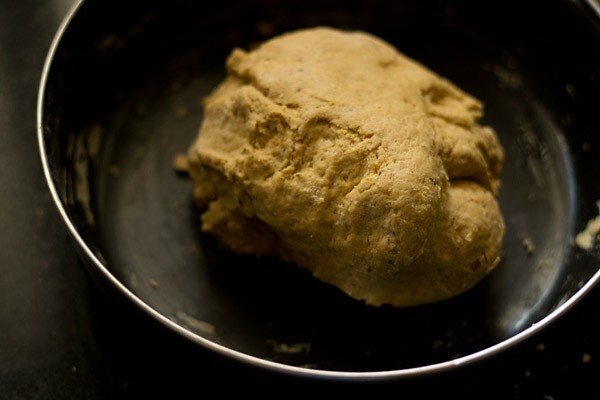 7. cover and let the masala poori dough rest for 30 minutes. 8. dough after 30 minutes. knead again. 9. divide the dough into small or medium sized balls. 10. take each ball. flatten it and spread a bit of oil on both sides. 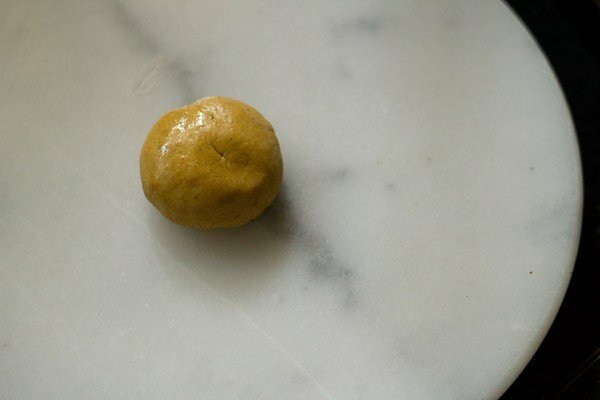 using oil while rolling is better than using wheat flour, as the whole wheat flour particles get browned or burned in oil, while frying. 11. roll this ball into a small or medium sized circle of medium thickness. don’t make too thick or thin. 12. heat oil in a kadai or pan till its medium hot. slid the rolled poori and deep fry in hot oil. 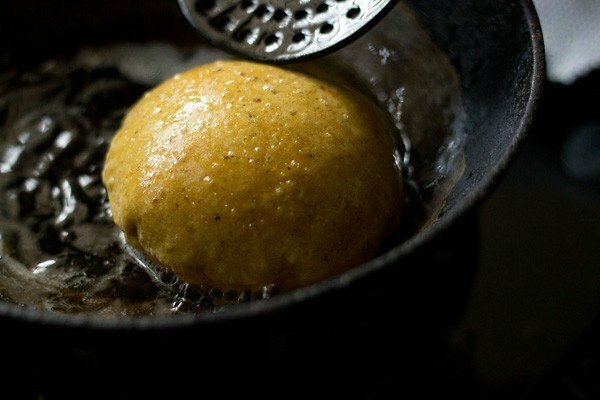 13. with help of a slotted spoon, gently nudge and press so that the pooris puff up. 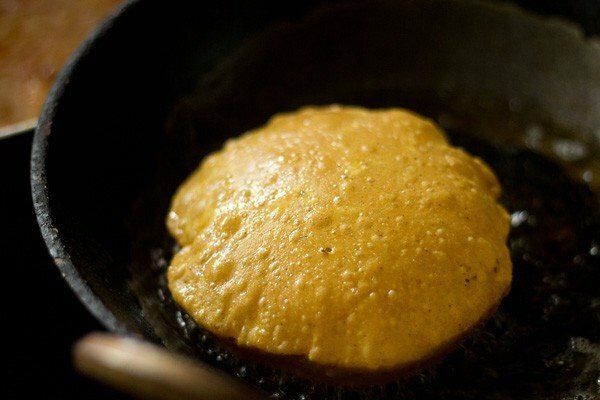 14. when the oil stops sizzling, turn over and fry the other side of the masala pooris. 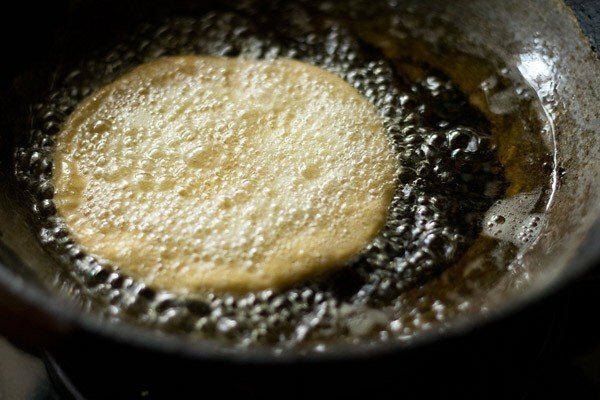 15. when golden, remove from the slotted spoon and drain the masala poori on kitchen paper napkins to remove excess oil. make all pooris this way. 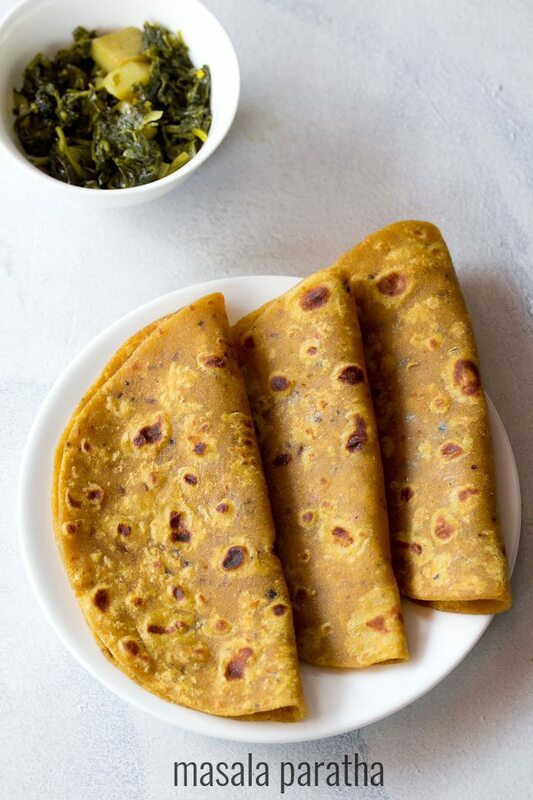 16. serve the masala pooris hot plain or with a side potato curry like jeera aloo or dum aloo or aloo matar or any aloo sabzi. I refer to ur recipes for trying anything new.. Your step by step procedure is really very useful.. N seeing the pics of each recipes makes me nostalgic n leaves me craving for it.. Thanks for all d mouth watering dishes.. Welcome Rakhee. Glad to know this. Thanks for sharing your positive feedback. I tried these today. Taste is of course lovely but my poories didn’t puff up. They are mostly flat. What would I have done wrong? welcome archana. first the dough has to be kneaded well. secondly you have to evenly roll the poori. lastly the oil should be hot before frying. if the oil is not hot enough then pooris will not puff up. i hope it helps. hola, la “cucharadita” es de café? es una Ts ó una TBs? gracias! thanks. there is matar and aloo poori.